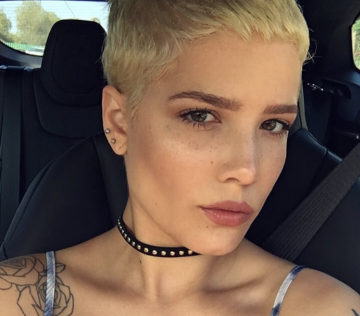 "New Americana" singer Halsey talks losing a pregnancy while performing, and why she'll never be the same. If you've heard Halsey's hit "New Americana" or caught one of her electrifying live performances, you'd assume the 21-year-old singer is tough as nails, but she recently revealed a vulnerability no one saw coming. In an interview with Rolling Stone, the self-proclaimed "stoner kid who made it" got real about some difficult topics, including her transformative miscarriage. Halsey, who was born Ashley Frangipane, admitted to reading a piece her interviewer wrote, a story about Planned Parenthood that detailed the writer's own miscarriage. "I felt like I was suffocating reading that article," Halsey said. "Like someone put a shopping bag over my head. I didn't want to meet you at all. I was really terrified of you, because I knew as soon as I saw you, I was going to need to tell you that last year on tour I got pregnant." Here's the thing: While self-blame in the wake of a miscarriage is a totally common thing, it's also senseless. “It is very common for women to blame themselves," Prudence Hall, MD, an OB/GYN at The Hall Center, tells Fit Pregnancy. "[But really, miscarriage is] a very complex interplay between the environment, hormones and genetics. For women to to take on and feel responsible for the miscarriage is taking on too much. The first thing that women ask me is, 'Did I cause this?' I say 'absolutely not.' It’s very important that women do not blame themselves. None of this is their fault." Luckily for Halsey, she took one important thing away from her miscarriage: A clear sense of what she wants from her life. "I want to be a mom more than I want to be a pop star," she said. "More than I want to be anything in the world."